Joe went to England in 1912, where he worked as a self-defense instructor for detectives at Scotland Yard. At the outbreak of World War I, Joe was interned as an "enemy alien" with other German nationals. During his internment, Joe refined his ideas and trained other internees in his system of exercise. He rigged springs to hospital beds, enabling bedridden patients to exercise against resistance, an innovation that led to his later equipment designs. An influenza epidemic struck England in 1918, killing thousands of people, but not a single one of Joe's trainees died. This, he claimed, testified to the effectiveness of his system. After his release, Joe returned to Germany. His exercise method gained favor in the dance community, primarily through Rudolf von Laban, who created the form of dance notation most widely used today. Hanya Holm adopted many of Joe's exercises for her modern dance curriculum, and they are still part of the "Holm Technique." 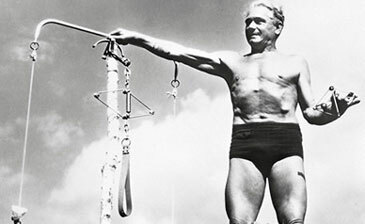 When German officials asked Joe to teach his fitness system to the army, he decided to leave Germany for good. The Pilates movement gains in popularity – from Europe to the U.S. In 1926, Joe emigrated to the United States. During the voyage he met Clara, whom he later married. Joe and Clara opened a fitness studio in New York, sharing an address with the New York City Ballet. By the early 1960s, Joe and Clara could count among their clients many New York dancers. George Balanchine studied "at Joe's," as he called it, and also invited Pilates to instruct his young ballerinas at the New York City Ballet. "Pilates" was becoming popular outside of New York as well. As the New York Herald Tribune noted in 1964, "in dance classes around the United States, hundreds of young students limber up daily with an exercise they know as a pilates, without knowing that the word has a capital P, and a living, right-breathing namesake." Joe continued to train clients at his studio until his death in 1967, at the age of 87. In the 1970s, Hollywood celebrities discovered Pilates via Ron Fletcher's studio in Beverly Hills. Where the stars go, the media follows. In the late 1980s, the media began to cover Pilates extensively. The public took note, and the Pilates business boomed. "I'm fifty years ahead of my time," Joe once claimed. He was right. No longer the workout of the elite, Pilates has entered the fitness mainstream. Today, over 10 million Americans practice Pilates, and the numbers continue to grow.